Small lot, big design. The urban landscape of Echo Park is getting a new, sleek look these days. 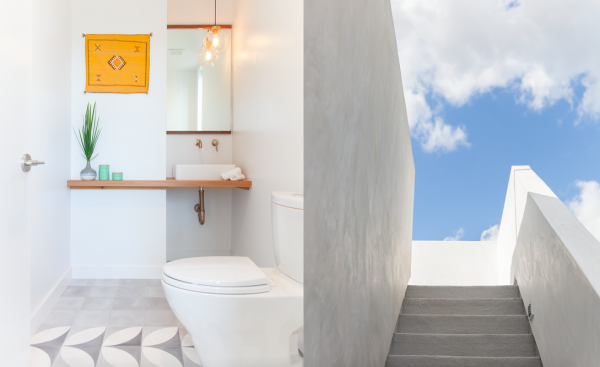 We present Rosey Jones, a collection of 7 single family modern homes on 3 levels, a rooftop deck, and plenty of design details. 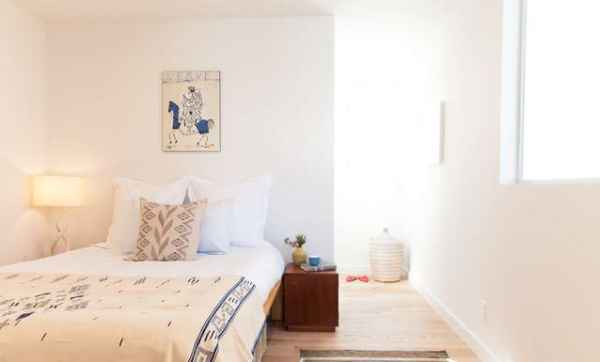 Located just south of Mohawk Bend and east of Echo Park Lake, each home offers sweeping views of DTLA and proximity to the city. 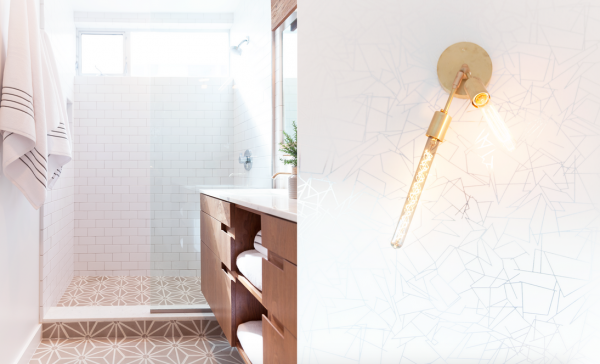 A collaboration between Sunia Homes, sheet/rockLA, and a local investor, these 3 bedroom, 3 1/2 bath homes vary in price from $779,000 to $989,000 based on location and yard amenity, but the same basic floor plan on 1,624 square feet remains constant. 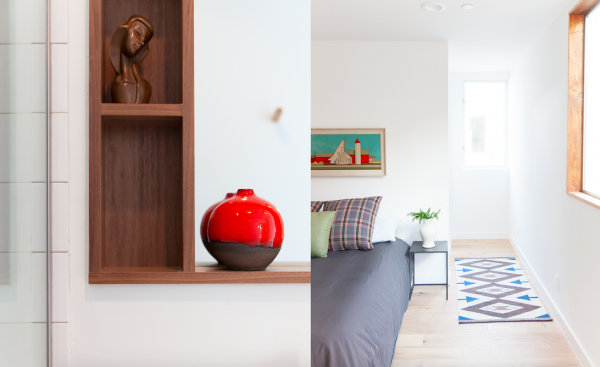 On the 1st floor, you’ll find a bedroom with bath en suite and a separate area for 2-car parking. On the 2nd floor sits the master bedroom suite, another bedroom with bath en suite, and a balcony. One floor up, you’ll find the main living and dining areas, a linear kitchen, a pantry and washer-dryer nook, a powder bath, and another spacious balcony. 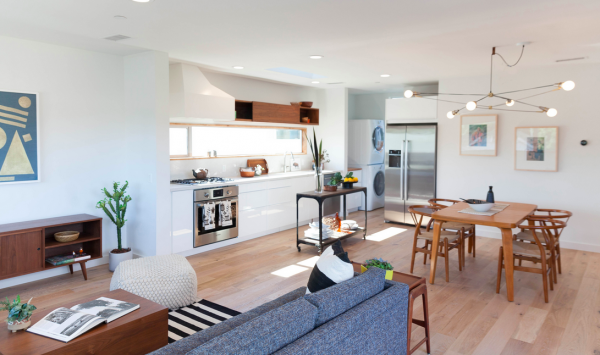 Wide plank French oak floors throughout, Heath tile accents, and Caesarstone kitchen counters shine in the 3rd-floor living space. A Bosch cooktop, stove, hood (disguised in white), and dishwasher are included with each home. 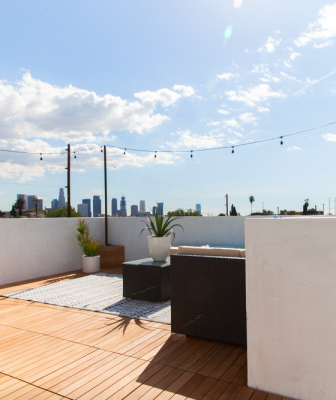 And, finally, an exterior staircase leads you to a rooftop deck with gorgeous views of DTLA. 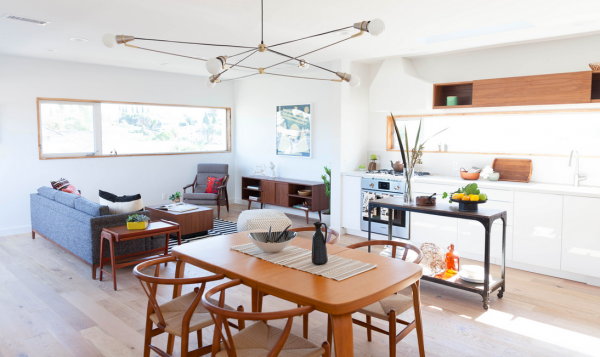 Optional upgrades can be added to the home, including a Brendan Ravenhill cord chandelier in the dining area, a Bosch fridge and/or washer/dryer, and wooden rooftop decking. Eddie Kohan, of Kohan & Associates, represents the Sellers.